Adam is a third generation auctioneer and graduate of the World Wide College of Auctioneering in Mason City, Iowa. He has earned a Masters of Business Administration and a Bachelor of Science degree in management and finance from the University of Nebraska at Kearney. Adam has taken further steps to build his business by becoming an active member in the Nebraska Auctioneers Association, and is a member of the National Auctioneer Association. These professional organizations offer Adam the newest techniques to market his client’s assets. Adam has been conducting or helping with auctions since 2009. Adam Marshall Auctioneers has a full team of auction professionals ready for auction day. As one of Central Nebraska’s preferred auction company, they are the first choice for accelerated & specialized marketing. Click “Hire US” at the top of the page to view our auction services. 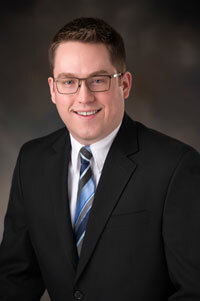 John Keeney is licensed Nebraska real estate salesperson for Adam Marshall Auctioneers & Land Brokers of Kearney. He is a lifetime Buffalo County resident and has been a licensed salesperson since 2013. In addition, John is a Certified General Appraisal and president of Keeney Real Estate Appraisal, Inc. and specializes in the appraisal of agricultural, commercial and special use real estate. John is an active member of the American Society of Farm Managers & Rural Appraisers. If you are looking to sell real estate or are in need of a real estate appraisal, contact John Keeney.